"Seeds of the Future Are Planted Today"
Transformation and growth are two concepts that inspired this project. "Seeds of the Future" depicts a transformational journey as the community reinvents itself and invests in the future. The design stresses the many ideas of connections in commuting and in states of mind. Two youthful figures illustrate the renewal and strengh of the community: a girl watering houses and a running boy with a bucket of star seeds. This figures suggest recent developement in education and housing programs in the community. In the four corners of the central panel, quilt patterns, monkey wrenches and wagon wheels icons recall the physical and mental journeys of transformation in the rich African-American heritage of the underground railroad. In the sky above, seven commuting birds symbolize hope and peace. Stars brightly represent the seeds of the future; they can be found on earth as well as in the sky. Trees of life on the side panels grow from books on which you can read the magic words "plant dreams." 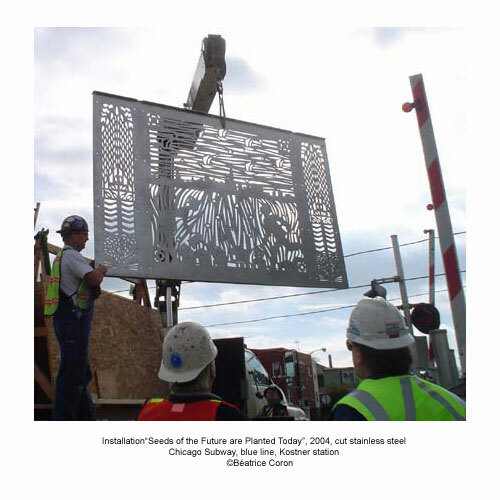 Each line of the drawing depicts the connection between Kostner and downtown Chicago. In the central panel on each sides of the subway entrance, the boy dynamically moves forward.On each side cutout panels echo Chicago's architecture found in the skyline of the central panel. The west entrance (main entrance) is framed by two additional panels.